Every once in awhile, a story comes along that once read, becomes a part of you. This is one of those stories. It is now a part of my history. A part of me. The characters are my dear friends, and the scenery something I long for. I read this book awhile ago and haven’t had time to review it until now. I miss it. If I had time, I’d read it again. Right now. It’s been a long time since a book has called out to me like that, and I love the feeling. It’s comforting. So what is the story about? Why did it draw me in like it did? 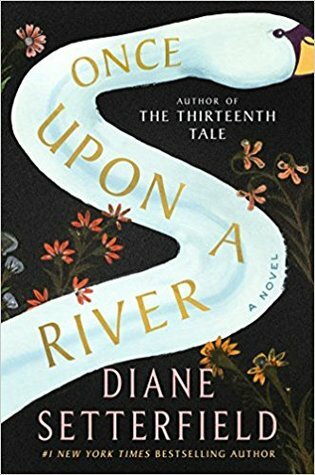 Find out in my book review of Once Upon a River by Diane Setterfield. On a dark midwinter’s night in an ancient inn on the river Thames, an extraordinary event takes place. The regulars are telling stories to while away the dark hours, when the door bursts open on a grievously wounded stranger. In his arms is the body of a small child. Hours later, the girl stirs, takes a breath, and returns to life. Is it a miracle? Is it magic? Or can science provide an explanation? These questions have many answers, some of them quite dark indeed. Those who dwell on the riverbank apply all their ingenuity to solving the puzzle of the girl who died and lived again, yet as the days pass the mystery only deepens. The child herself is mute and unable to answer the essential questions: Who is she? Where did she come from? And to whom does she belong? I do not read the blurbs on the covers of books before I read them. I want to be carried away and surprised by the story. Both occurred when I read this book. The setting is perfect. The descriptions of the river and the surrounding land made me feel as if I were there, standing on the bank looking into the cool water. The descriptions of the inn called The Swan took me there and placed me at a table listening to the stories told. The characters, oh the characters. There are many of them. Each character is so well crafted that he or she becomes someone you’ve always known. Each has a unique personality, strengths, weaknesses, and beliefs. At times, one character comes into the spotlight and you get to see a deeper glimpse into his or her life. In that moment, you understand a little more of the picture being painted. You are able to solve a small piece of the mystery—until you’ve finally seen enough to see the whole. This book comes to life because of the characters. Diane Setterfield is a master character crafter. Seriously. The story is told from many viewpoints, yet they all come together as one. It’s seamless. You get so caught up in what is happening that you don’t even realize the point of view has changed or that there’s a new chapter. The writing style is captivating, engaging, and intriguing. You.can’t.put.it.down. No matter where you go or how long you’re gone, you think about this book. You think about it cooking dinner, at work, and in the shower. It haunts you (in a good way) until you have to finish it to see what happens. If you can’t tell, I loved this book. It’s such a unique story, filled with miracles, love, loss, stories, science, the river, and people. It’s a little gossip and a lot of love and mystery surrounding a small child. It’s a town where nothing unusual happens—until it’s the town where the unusual does happen. The book has such a unique feel, tone, and atmosphere, and I loved it. Disclosure: I did receive a free copy of this book in exchange for an honest review.